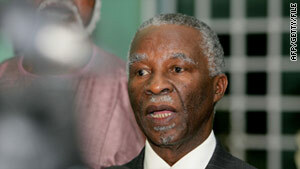 Thabo Mbeki, pictured here in October, has been sent by the African Union to meet both sides in Ivory Coast. Abidjan, Ivory Coast (CNN) -- A European Commission spokeswoman hinted Monday at the possibility of sanctions against Ivory Coast if the country is unable to resolve its disputed presidential election. Catherine Ashton, vice president of the commission and the European Union's high representative for foreign affairs and security policy, would consider sanctions "if there isn't a swift resolution to the crisis," commission spokeswoman Angela Filote said. Filote declined further comment on the threat of sanctions, which comes two days after rival presidential candidates each claimed office and a day after former South African President Thabo Mbeki arrived on an emergency mission to try to help resolve the sitaution. Despite ongoing protests, the situation has remained largely calm in Ivory Coast following the disputed election in which incumbent Laurent Gbagbo and challenger Alassane Ouattara both claimed victory. But the political chaos has heightened fears that the Ivory Coast -- known as Cote d'Ivoire in French -- would once again plunge into the unrest and bloodshed suffered after a civil war broke out in 2002. A United Nations spokesman, Farhan Haq, said Monday that in light of the country's security situation, the U.N. will temporarily relocate about 460 non-essential staff members to Gambia. And Amnesty International called on the country's security forces to protect civilians, claiming that at least 20 people have been killed in the aftermath of the election. There was no official confirmation of Amnesty's claim. Gbagbo has defied international appeals to step aside and was sworn in Saturday as the new president in a formal ceremony inside the presidential palace. The ceremony was broadcast live on television. Less than a hour-and-a-half later Ouattara told reporters that he, too, had taken the oath of office and asked Prime Minister Guillaume Soro to form a new government. Mbeki, sent by the African Union, met with Gbagbo and the U.N. special envoy to the country in Abidjan before meeting with Ouattara, according to Mbeki's spokesman, Mukoni Ratshitanga. Mbeki met with Gbagbo at the presidential residence and with Ouattara at an Abdijan hotel he is using as a headquarters. He was also to meet with the electoral commissions and the nation's Constitutional Council. Mbeki told reporters he was sent by the African Union to hear out all the parties and make recommendations. He said he would issue a statement later. Ouattara told reporters he was "honored to receive Mbeki as the president of Ivory Coast." Meanwhile, a Soro spokesman said the prime minister presented the new government that Ouattara told him to form. But Gbagbo announced that he had designated his own prime minister in nationally televised address Sunday night. He named Gilbert Marie Ngbo Ake, an economist and former president of the University of Abidjan, who hails from a region of the country that has long supported Gbagbo. On Sunday, the army announced on national television that the country's borders and airspace would be open on Monday morning. The border had been closed last week amid rising tensions following one commission's announcement of Ouattara as the winner. International broadcasting agencies were shut down at the same time. The Constitutional Council declared Gbagbo the winner Friday, invalidating earlier results from the Independent Electoral Commission which handed Ouattara the victory with 54.1% of the vote. It was the job of Y.J. Choi, the special envoy in the Ivory Coast of U.N. Secretary-General Ban Ki-moon, to review and sign off on the results. Choi said that, even if Gbagbo's complaints were taken into consideration, Ouattara was the winner. "Having evaluated all the tally sheets, 20,000 of them yesterday evening, we are in a position to know what happened really," Choi said in a telephone interview from Abidjan. "With absolute certainty, we know that Ouattara won the election." With his credibility in question, Gbagbo defied calls from international leaders to respect the will of Ivorian voters by taking the oath of office in front of a room full of supporters and military commanders. "These past days I have noticed serious cases of interference," Gbagbo said. "The sovereignty of Cote d'Ivoire is not negotiable. My responsibility is to defend it." The dispute has drawn international criticism and concern, with French President Nicolas Sarkozy and U.S. President Barack Obama among world leaders urging a swift resolution that respects voters' wishes. On Monday, Ban said he remained "deeply concerned" about the situation and has been consulting with many world leaders on the crisis. On Sunday, the World Bank and the African Development Bank issued a joint statement warning that the dispute could hurt economic stability in Ivory Coast and the region. Earlier, Sarkozy appealed for calm and urged military and civilian officials to respect the will of the people. Obama warned Gbagbo: "The international community will hold those who act to thwart the democratic process and the will of the electorate accountable for their actions." Ouattara, a former economist for the International Monetary Fund who served as prime minister, had been banned from previous races. Gbagbo's critics said the incumbent stoked tensions by accusing Ouattara of masterminding the civil war. Ouattara has denied the allegation. Once a prosperous nation and a driving force in West Africa, the Ivory Coast spiraled downward into instability after fighting erupted between the government-held south and discontented Muslim rebels living in the north. Thousands of people died in the conflict. Ouattara enjoys popular support in the rebel-held north and now, with both candidates claiming they are president, the potential exists for more bloodshed. The streets of Abidjan have already seen violent clashes in the past few days. Journalists Francois Xavier Menage and Eric Agnero contributed to this report.